Voting Precincts, led by Precinct Chairs, are the smallest and most local political units legally recognized by the State of Texas. Our goal as a county party is to organize every Voting Precinct by electing or appointing Precinct Chairs. The Precinct Chairs represent their neighborhoods at our monthly meetings and communicate with their neighbors about Libertarian candidates and issues. As a grass-roots organization, it is extremely important that we organize each neighborhood in Williamson County. Please contact our Chairman if you would like to serve as a Precinct Chair for your neighborhood. 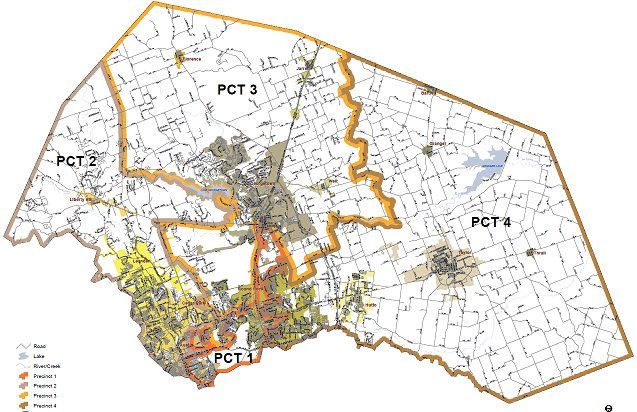 Williamson County is also divided into 4 large County Precincts. The county Executive Committee is made up of two representatives from each of these large precincts. You can verify which precinct you live in by checking your Voter Registration Certificate issued from Williamson County. In the sample below, the red circles indicate County Precinct 4. And the yellow circle indicates the small neighborhood Voting Precinct “488”. The first number in the Voting Precinct also corresponds the number of the large County Precinct.